For thousands of eager Disney visitors, the beginning of autumn brings with it the beginning of the Epcot Food and Wine Festival. For me though, the annual festival begins in the middle of summer with a Preview Dinner event that has been offered to Tables in Wonderland members for three years running. It provides our first taste of new flavors and information on many of the events that will begin taking place two months from now. As a copywriter of sorts, every piece of information that is released about the upcoming festival is collected and passed along to you through these pages, and is digested as quickly as a cup of Le Cellier's Cheddar Cheese Soup. Once the festival has been running a few weeks though, the grist mill of new information grinds to a halt, and so does much of the online activity. One of the new items for 2014 is a Sweet Corn Sorullito with Mayo Ketchup from the Puerto Rico kiosk. 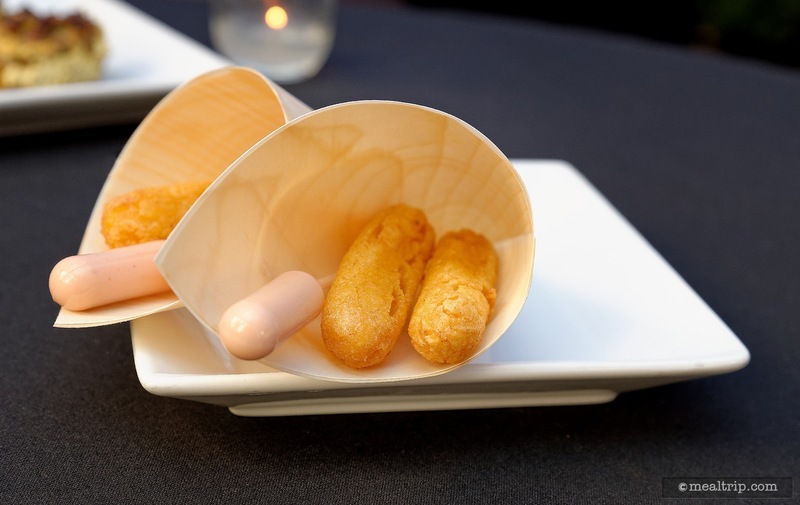 We don't think they will be served in these cute wooden cones though. In a way, that's one of the trends we hope this website can reverse. As an open review system, including all the individual food items available at every kiosk... we really want to know how you feel about all of the items you've tried. (The review system for this year's festival will be available a few days after September 19th, 2014.) Information like that, will help everyone find items they will enjoy right up to the last day of the festival and even into next year's event. With over 30 new items available at the kiosks this year, there will be plenty of flavors to experience throughout this year's 53-day festival, the longest in the Food and Wine Festival's 18 year history (19, if you're counting this year). 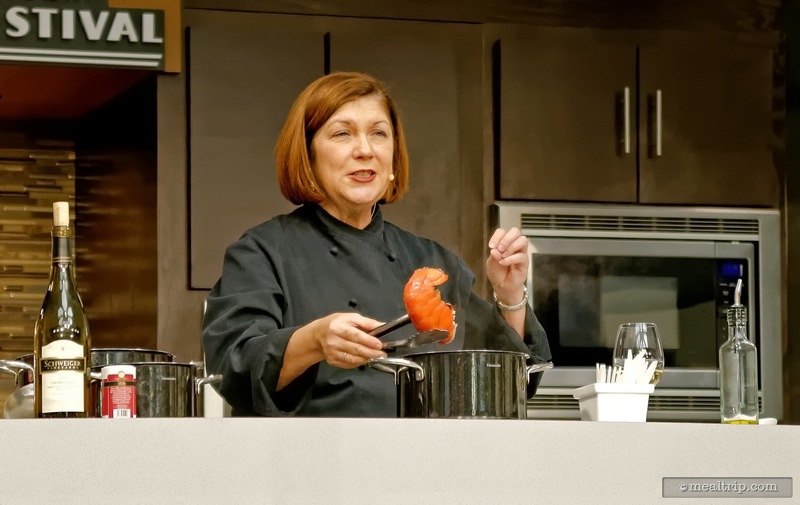 Pam Smith R.D., at one of Epcot's Culinary Demonstrations. What many visitors don't know, is that at the first Preview Dinner event for the Food and Wine Festival (which took place a few days ago), and at the very last event, on the very last day of the festival (a Culinary Demonstration in the Welcome Center), Pam shares with all in attendance, an unofficial toast to open and close that year's festivities. Over the years, I have found myself attending both events, (and so many in between), that I quite look forward to raising a glass and bookending my experience over the next few months with these toasts. Hence, the new column title for all of our Epcot Food and Wine Festival coverage this year... "From Toast to Toast". It's my hope that we can present a few interesting pieces of information, ideas and photos about the festival, in a way that's a bit different than what's come before... in addition to our kiosk item rate and review system. Pam Smith giving us a few pointers about preparing lobster. And so, without further ado... 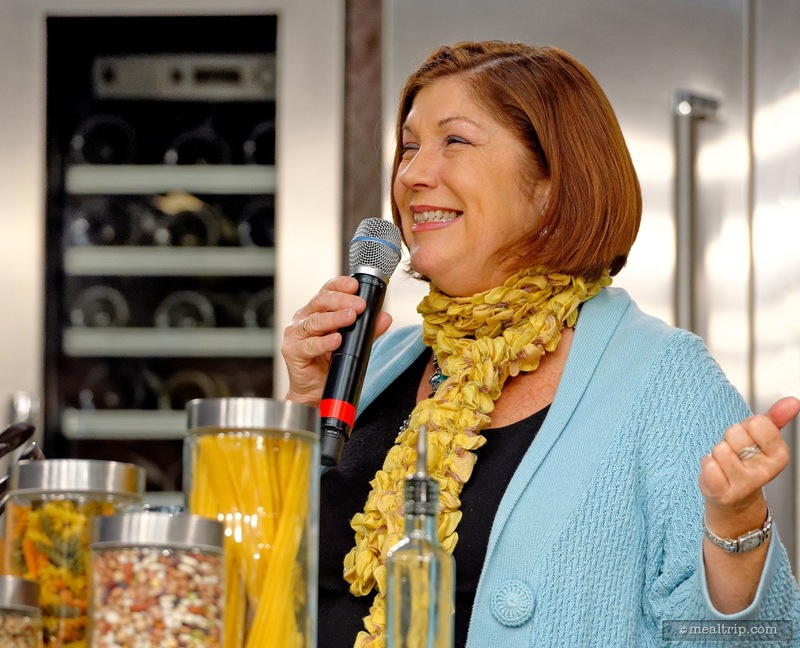 I will let Pam Smith's unofficial opening toast for this year's Epcot Food and Wine Festival serve as the end of this first entry into our new column, From Toast to Toast. We hope you'll continue to follow along! "Many consider New Year’s to be that day in January, but as we gather tonight for a first glimpse at the New Year (the 19th one!) of Amazing Tastes and Sips to come, please raise your glass as we toast to a year filled with Great Food, Great Wine, Great Friends and Laughter — for 53 days, and Happily Ever After! Happy New Year!" You can read more about Pam Smith and the P.S. Flavor!™ Wholesome Spice Blends by clicking here... psflavor.com ... and here... pamsmith.com .